After successful high school wrestling careers, Pittsburgh natives Dom Forys and TeShan Campbell are on the cusp of greatness at the next level. Both Forys and Campbell sit inside the top 15 of the latest InterMat NCAA rankings — Forys is ranked No. 7 at 133 pounds, while Campbell slides in at No. 13 at 165. The rankings won’t mean much at the end of the season, as it’s the performances that will count. But they do highlight the respect both are earning in the wrestling community. 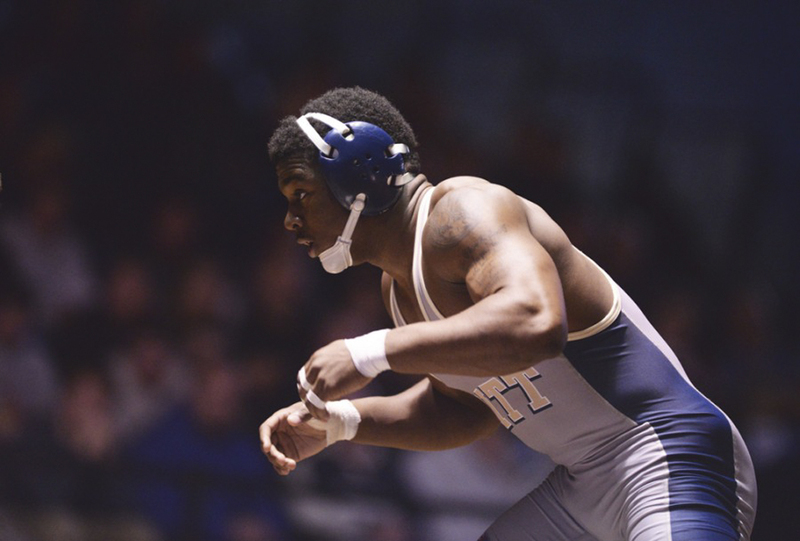 Coming off a PIAA championship as a senior at Penn Hills High School in 2015 — which he won while hobbled by a sprained MCL — Campbell competed at 174 pounds for Pitt as a true freshman. He didn’t have to worry about cutting weight, but he matched up against mostly larger and more experienced opponents who walked around well above the 174-pound limit. Campbell still found success at 174, posting a 17-8 record in the regular season. He didn’t win a match at the NCAA Tournament, but showed plenty of potential in a hard-fought 3-2 defeat versus No. 10 Mike Ottinger of Central Michigan. He also held a late lead before falling 10-7 to South Dakota State’s David Kocer in the consolation bracket. Now competing at his more natural weight of 165 pounds, Campbell is noticeably leaner and able to use his trademark quickness to an even greater advantage. Campbell began his sophomore season unranked, but that quickly changed when he pinned No. 19 Austin Reese of Ohio in the Panthers’ first match of the season. As a result, he appeared at No. 19 in InterMat’s next rankings release. Campbell then defeated No. 11 Austin Matthews of Edinboro, 9-6, in Pitt’s next match, prompting his rise to No. 13. He entered Pitt’s Dec. 4 matchup in Stillwater, Oklahoma, against the No. 1 Oklahoma State Cowboys with a perfect 4-0 record in dual-meet competition, but lost a 10-6 decision to Oklahoma State’s Chandler Rogers — the No. 4 165-pounder in the nation. Pitt head coach Jason Peters, though, believes Campbell’s perfect record might still be intact if the match had taken place elsewhere. Forys also enjoyed a decorated high school career, compiling a school-record 151 wins at western Pennsylvania powerhouse North Allegheny High School. But he never achieved his ultimate goal of winning a PIAA championship, something that drives him to reach that pinnacle at Pitt. As a sophomore, Forys went 24-2 in the regular season and fell one win short of cracking the top eight and earning All-American status at the 2016 NCAA Tournament. This year, he’s looking beyond just becoming an All-American — his goal is to be on top of the podium in March. Forys’s quest got off to a great start, as he won his first seven matches to start the season — including two over ranked opponents. He then ran into Oklahoma State’s heralded first year, No. 6 Kaid Brock, and dropped a 10-3 decision. Despite losing his undefeated record, Forys said he’s much happier to take the loss now than taking it at the NCAA Tournament in March. Peters said battling against the best wrestlers in the country is more important than compiling wins and losses.